Scientists and experts are invited to participate in the first external review of the chapters of the landmark IPBES global assessment of biodiversity and ecosystem services, from 15 June until 15 August, 2017. 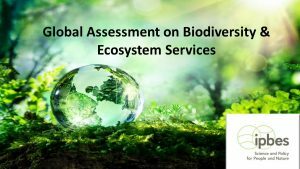 This assessment will be the first global snapshot of the state of the world’s biodiversity in more than a decade, since the release of the Millennium Ecosystem Assessment. The global assessment will provide decision makers with the state of knowledge regarding the planet’s biodiversity, ecosystems and the benefits they provide to people, as well as the options to protect and use these natural assets more sustainably. Furthermore, the global assessment will provide vital data to assess progress against the Aichi Biodiversity Targets and the Sustainable Development Goals. One of the most important phases in the IPBES assessment process is the external review by interested and qualified experts, including scientists, decision makers, practitioners and other knowledge holders. The widest-possible participation and most diverse engagement of experts in this first external review is vital to ensure the scientific quality and policy relevance of the global assessment. The global IPBES assessment will be published in 2019 and a 2nd order review will take place during 2018. Register as user of the IPBES website (http://www.ipbes.net/registration_global_fod) if you have not already done so. Apply to become an IPBES external reviewer for individual chapters of theglobal assessment at http://www.ipbes.net/user/login?destination=registration_global_fod (this will only work when logged in first as IPBES website user). Once registered, you will immediately receive an email providing confidential access to the draft chapters and will be requested to submit your comments in English using a template that is available on the same webpage. Concurrently running are the external 2nd order reviews of other IPBES assessments for Africa, Asia-Pacific and Europe and Central Asia, and Land Degradation and Restoration (ending 26 June 2017) and the Americas regional assessment (ending 24 July 2017). This external review of the global assessment is a separate process, running in parallel to the others. Information on the review process on these regional and the thematic assessments can be found here: http://www.ipbes.dk/review-of-ipbes-assessments-open/.